Home › Ask Geo › Who Needs Education? Dan asked: Who needs the most help, the cyclist, law enforcement, or both? There’s a LOT of room for improvement all around. This pie chart is from the FBA cyclist education course. 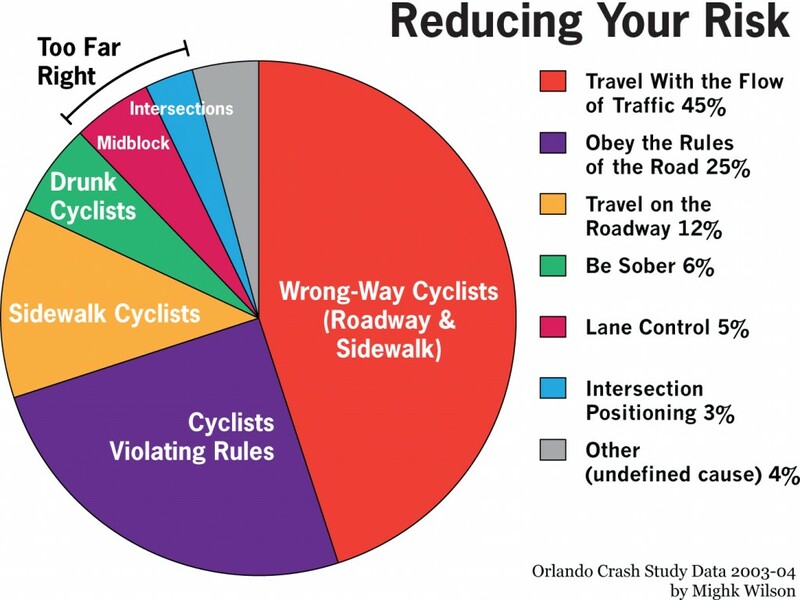 The data comes from a crash study done in Orlando, but numbers are consistent with most cities in Florida. There are many that still believe the law requires them to ride against traffic. That has been shown to be dangerous, and it is illegal in the roadway. Cyclists that know the laws and comply, practice safe cycling practices, and ride as though they are driving a vehicle on the roadway, which of course they are, seldom become statistics. They not only avoid causing crashes, they can prevent crashes caused by common motorist mistakes. Some officers are not fully aware of the laws about cycling. Most receive little or no formal training. Some see all cyclists in the light of those they see in crashes, primarily those above who have been killed or injured through unlawful actions. If they are not cyclists themselves, they may not understand safe cycling practices, and feel they are acting in the interests of the safety of the cyclists. Another area that isn’t clear to many, including police officers, cyclists, and motorists, is the fact that impeding traffic while otherwise operating legally, is not unlawful. We are living in a motor vehicle society, and traffic flow is sometimes considered more important than safety. When the emphasis is on traffic flow by someone who doesn’t understand safe cycling practices, it is a recipe for problems. There is a vast gulf of misunderstanding by the motoring public of traffic laws in general, and those related to cycling. Let’s not leave out government officials, who set the policies about cycling, and the folks who design and build our roads. If they don’t ride bicycles, they may not understand the importance of their work on cycling. We can change that. That is the purpose of the program the FBA is developing. See Bicycle Law Enforcement Program. It is a cooperative effort of cyclists and law enforcement. FBA is doing the work with the recommendations and advice of the Officer Advisory Panel. You can help that effort with your financial support. We need about $100,000 this year to complete the program. Last year’s work was funded by a single very generous donation of $70,000. The first modules will be available soon. Ask your club to donate $5,000 or whatever they can. Of course your private donations will help.